Dylan Locke knows that pining over the young ingenue Audrey Lind is pointless. He can’t offer her what she wants. He definitely can’t give her what she needs. Thank goodness she’s half a world away, and he doesn’t have to deal with his attraction head on. But fate has other plans for him, and when Audrey once again lands in his path, it’s only too easy to fall back into their easy rhythm. And then their easy banter. And of course, each other’s arms. He tells himself nothing has changed. She still wants forever, and he still thinks tomorrow is long enough. But watching her search isn’t as easy as he thought it would be, and now Dylan must figure out if he’s really the love Scrooge he professes to be or if he’s been Fate’s willing victim all along. Fate finally played its hand. 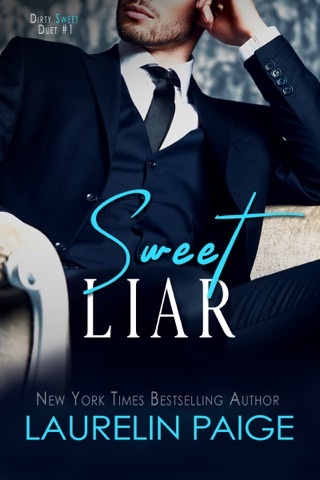 I loved the first book in this duet, Sweet Liar. Audrey was all sunshine to Dylan’s cloudy skies. But this book was all Dylan’s POV, and to me it made the book imbalanced. I was annoyed with Dylan’s inner monologues most of the book. Audrey called Dylan a coward, and I wholeheartedly agreed because he was so bitter and cynical from a previous relationship and scared to admit out loud that he had actually fallen in love with her. Audrey got points from me for taking charge of her life! Dylan almost lost her, but Audrey really did drag Dylan into her sunshine! The last section of the book & the happy ending did make up for most of the drawn out cloudy skies! Great read! Love Audrey and Dylan! A great conclusion to Dylan and Audrey’s story. I enjoyed that it’s told in Dylan’s POV. I enjoyed reading about their journey as they overcome their obstacles and insecurities. A great ending for this duet.